Self-piercing screws are special fasteners that are designed to pierce light gauge metals and tap their own mating threads as they’re driven into the material. They are essentially the same as self-tapping screws, but with extra-sharp points that allow them to penetrate sheet metal. Self-piercing screws are known by numerous other names, including zip, needlepoint, saber point, sprint point, speed point, and twinfast screws. 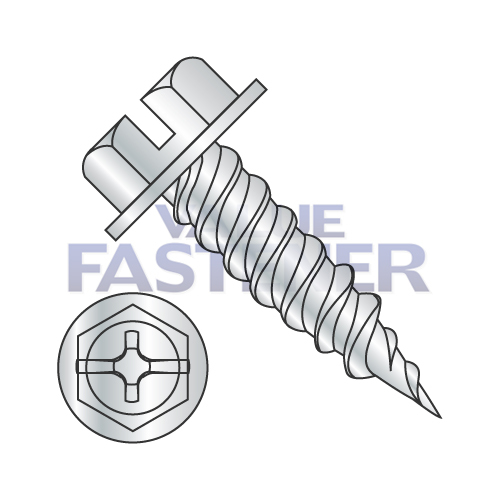 Value Fastener offers a wide variety of self-piercing screws, including steel and stainless steel options. Our stainless steel screws are available in 18-8 and 410 grades for superior corrosion resistance. Our selection includes hex washer head and modified truss head options. Follow the links above to find the self-piercing screws you need, or use the filters at left to narrow your search by size, length, material, finish, or other factors. See individual product listings for additional information and specifications. Washer head self-piercing screws provide a large, flat load bearing surface that reduces the likelihood of crushing thin materials. Modified truss self-piercing screws feature even wider, washer-like heads that help prevent crushing when used with thin metal. These self-piercing screws feature Phillips drive for fast, easy installation. We have the durable, high quality self-piercing screws you need, along with a huge selection of fasteners for all applications. Order today, request a quote, or contact Value Fastener for self-piercing screws for your project.